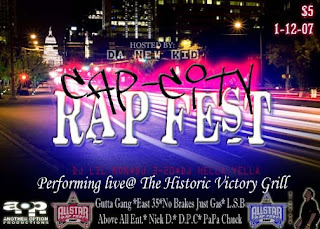 Nick D. ping'd us about his show Cap-City Rap Fest @ The Historic Victory Grill... tonight, Feb 12th... preforming will be Nick D., Gutta Gang, East 35, No Brakes Just Gas, L.S.B., All Above Ent., D.P.C., and PaPa Chuck. Well I'm set a packing to Zurich again... for 2 weeks this time... see ya'll in Zurich sucka's. Victory Grill is a historic music venue located at 1104 E. 11th St, Austin, Texas. The nightclub was on the Chitlin' Circuit and hosted famous African-American acts such as Bobby Bland, Gatemouth Brown, W. C. Handy and B. B. King during the age of racial segregation in the United States. Victory Grill was added to the National Register of Historic Places on October 16, 1998.